ABIM's deafening silence?!?! With Rich Baron's >$750,000 salary?!?! UNREAL! but not unexpected! Indictments anyone? Yes, that really does speak volumes. Any physician executive who took the Hippocratic Oath and honestly believed in the purported intentions of the ABIM, would have long ago acknowledged the need to clean house and stepped down. Not "dr" rich baron, he's not leaving until his pockets are stuffed and he's hauled kicking and screaming out the door. Same goes for the ABIM board. The horrible stench grows worse. 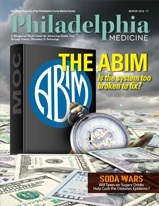 How can you trust the process when you can't trust the ABIM/ABMS? I vote no to MOC and the elites who foster it. It's clear that ABIM is all about the money, and hanging on to political control! Richard Baron is a smart medical politician, but his inadequate response to tough questions in Philadelphia Medicine Magazine is politically dumb. ABIM's high cost of maintaining punitive wars and focus on self-enrichment leaves very precious little to carry out the time-honored mission of the ABIM. I find it hard to fathom how an alleged ethical society such as the ABIM could plan and carry out covert operations against financially vulnerable physicians starting in 2008 (and still going on today), when it cannot successfully fulfill its obligations to the public to create viable, current and relevant educational materials. When it claims to listen, but cannot hear the main thesis being presented by the vast majority of its 850K certified physicians in the ABMS. The mandate of 'MOC' should end immediately. The AMA House of Delegates heard and responded. What is voluntary should be voluntary again. MOC is history because it did not work for anyone except those who walked away rich from the ABMS. Executives at the ABIM have an over-riding fiduciary obligation to the organization and to its clients. They failed to rein-in costs, both for clients and for the survival of the organization, in lieu of their political thrusts, lobbying, and "counter-terrorism operations" with Ariel Benjamin Mannes (ABIM/Caveon) and Ballard Spahr (attorneys for ABIM). This has turned out to be a scandal of the first magnitude. (Would that our surveillance of the ABIM inner workings show how sweaty Baron and Holmboe got following the orders of Christine Cassel and Lynn Langdon. All with tacit approval from Mr. luxury condo himself, Robert M. Wachter. The "shady governance" and "shadow organization"(ABIMF 1989-2007 laundered investments) should be completely exposed and put under the magnifying glass. Why is it that the retirement investments and payouts have outpaced the value of the entire organization? The original by-laws strictly forbid any such self-enrichment programs. Who is currently benefitting from ABIM's retirement packages, and who plans on inuring themselves in the future? Can we see a complete audit of such payouts since 1975 to have a chronological perspective? One other question: why has the ABIM invariably used local Ballard Spahr attorneys to deal with legal issues. But not with the Puerto Rican physician Dr. Salas Rushford. Why New Jersey and not San Juan? This is very curious. Even in Lasko v. the ABIM local Las Vegas attorneys for the vast network of ABIM are utilized. Surely a simple single count copyright case could be handled in Puerto Rico. Or is it political persecution? Strong-arming? Too much to conceal that cannot be trusted with anyone other than Ballard Spahr, Philadelphia. Does it have something to do with the hand-selected New Jersey judge they are utilizing to ensure that justice is blind? Yes, the silence is deafening. "In early March of this year (2015), writer Kurt Eichenwald contacted ABIM staff for information about an 'article' he was working on for Newsweek regarding the 'controversy involving maintenance of certification at the ABIM.'" . . .
Mr. Baron never granted an interview to Kurt Eichenwald saying that the journalist was "too shrill." What does Baron want in terms of format from PMM? It is almost like his own magazine and Philly membership is reasonable, like a family? This guy just does not want to face the truth that ABIM has a checkered history and has lost credibility. He must do the honorable thing and stop drawing his lucrative salary, step down, and get his head back on the earth--doing something real for people. Right now it is all political and financial head games. The other executives at the ABIM are very suspect in what they are doing as well. We may build some new system in place of MOC, but until we have a full house-cleaning at the ABMS and the ABIM we will not be rid of the smell. It is time to fumigate and eject this redolent fetor which fills the ranks of our ‘leadership’. End MOC now. End MOC today. Rid medicine of this fraud, this embarrassment, this menace! who will visit you in jail dr. baron?